Walkie talkies are great to have around, and they can enhance communication between friends and family, as well as work excellently in emergency situations to check that everyone is safe. However, you may find yourself a little stuck when choosing which one to get, especially when faced with long-range and short-range walkies. The former often seems like the best choice, but it won’t necessarily work the way you want it to. So, to save you hassle and confusion, this little guide looks at both types of radio, their range, frequency, and configurations. What are Long Range Walkie Talkies and Short-Range Radios? A long-range walkie talkie is quite self-explanatory in that it is designed to offer you a much wide range of transmission and reception. However, while a long-range walkie talkie might say that you can get up to 36 miles of range, it is important to remember that there are factors that can hinder this – leaving you with maybe two or three miles instead. We will explore this in further detail later on in this guide. The short-range radio is another form of walkie talkie, and once again it does as described – making it another one that offers both simple operation and explanation. Obviously, it has a shorter range than the type of walkie talkie above, but it is still able to offer clear communication as well as excellent range. To learn more about each type of two-way radio, make sure to check out the other sections below. Where will you use the radios? As this guide continues, you will be able to match these requirements to the features offered by long-range walkies and short-range radios. You can buy walkie talkies of both types that are part of the General Mobile Radio Service (GMRS). These particular models are incredibly high-powered, and they can operate on one or two watts as well as access around 50 channels. They never used to be available for recreational use and were commercial models only, but this is no longer the case. However, you will need a license in order to access certain channels and frequencies. There is also the Family Radio Service (FRS) option, which requires no license to use and tends to be the most commonly chosen format. They tend to operate on half a watt, and a typical model is able to access 14 channels. However, you will also find that there are walkie talkies that can use 22 channels if you want something with wider availability. There are also a couple of other types that are available, one of which is the handheld variety. This is the most common form of walkie talkie, and the one that you tend to see in films, as well as most prominently in stores. You can also get models that are mounted to the dashboard of your vehicle and connected to its battery, something which you will commonly see in military and emergency response vehicles. These tend to be long-range walkies as opposed to short-range ones. We’re going to start with the range in this section because it is one of the most important things to discuss. When you pick up a long-range walkie that promises incredibly range, you are likely to be disappointed when you start using it at home or in a built-up area. This is because there is a lot of interference from buildings, crowds, and other such obstructions. As a result, your promised three or more miles could easily turn into 500ft or less. This is why a long-range walkie talkie is not always a better choice above the short-range models, as either of them could easily accommodate the range that you need. However, if you are planning on using the walkies while travelling through wide and open areas, the long-range one might be the best solution. The antenna is also an important aspect when it comes to range, and usually the bigger the antenna, the better the signal. However, if having a compact model is more important to you, then you are likely going to need to stick with a smaller antenna. Long-range walkies tend to have larger antennas, whereas short-range have smaller and more compact ones a lot of the time. The long-range radios do, as mentioned before, have access to a wider range of channels, and one of these is great to have when you are travelling or camping in open spaces away from civilisation. The weather channel can be tuned into any time, and it will let you know the latest forecasts and warnings for the area that you are in – so you can always be prepared. The battery is also important, and something you need to consider. The short-range models need less power to operate, and therefore they don’t need to have as many battery replacements, and they tend to last longer than their long-range counterparts. So, if you are searching for longevity over anything else, the short-range models are definitely the ones to go for. Picking a walkie talkie, either short-range or long, that is waterproof is also an excellent choice, and one that should be carefully considered. If you are travelling or spending a lot of time out in the elements, chances are you are going to hit rain at some point, and having your walkie talkie break or become permanently damaged as a result is not what you want. Instead, be smart and invest in a model that is waterproof or water resistant so that it will last through all of your adventures. 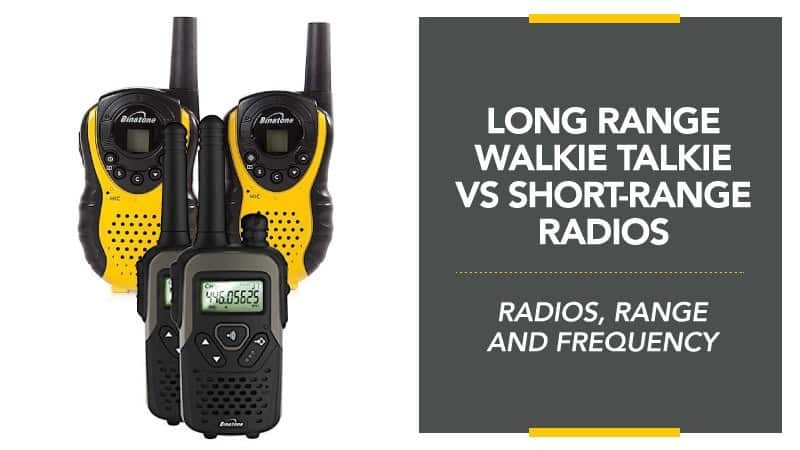 We hope that this guide has helped you to understand more about the differences between long-range walkie talkies and short-range radios, so you can make a good choice when you go to buy one – as well as a decision that works best for you and your situation. There are so many factors to take into consideration, which is why we narrowed it all down for you. If you found this guide helpful, or if there are points you think we should have included, please leave us a message in the comments below with what you think.